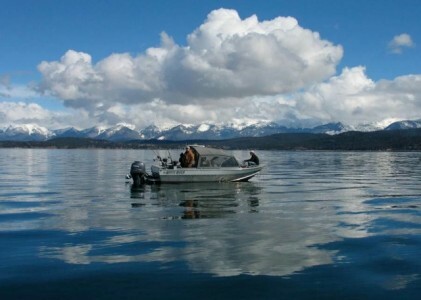 Spring 2018 Mack Days began Friday March 16th and will end Sunday May 13th –anglers can fish for lake trout on Flathead Lake Tuesday through Sunday for a total of fifty one days. Mack Days is sponsored by the Confederated Salish and Kootenai Tribes and is used as a fisheries management tool to reduce the numbers of non-native lake trout in Flathead Lake to increase the numbers of native bull trout and westslope cutthroat trout in the lake. There are two events per year one in the spring and one in the fall. All it takes is one fish to win one of the thirty five cash prizes which begin at $1,000 and goes to $450 or one of several merchandise prizes in the lottery drawing the last day of the event. The native fish are important to the history of the Confederated Salish and Kootenai Tribes and to the state of Montana. There is Up to $225,000 in Cash and Prizes that will be awarded at the end of the event. Categories available are the Top Ten Angler (angler with highest 18 day average), Ladies, Over 70 (age 70 and up), Youth 13-17, Youth 12 & Under, Captains Prize, Weekend Drawing, Largest Lake Trout, Smallest Lake Trout, and Tagged Lake Trout. There is one-$10,000, 3-$5,000, and 5-$1,000 tagged lake trout and over 6,000 with values from $500-$100. Anglers also are awarded bonus amounts depending on their total at the end of the event. The higher the total number of lake trout they enter the higher the bonus. For information, rules, fish ID, bonus chart, etc. go to the website at www.mackdays.com and click on the events tab. Making history in 2018 Spring Mack Days which is the thirty-second event was lady angler Brandy Hilde from Bigfork who on Friday was the first lady angler to catch a limit of 100 lake trout in one day. Brandy and partner Sam Cusker each turned in 100 along with Steven Benson of Spokane Valley, WA, Mike Benson of Lonepine, and Kalispell angler Jason Mahlen. 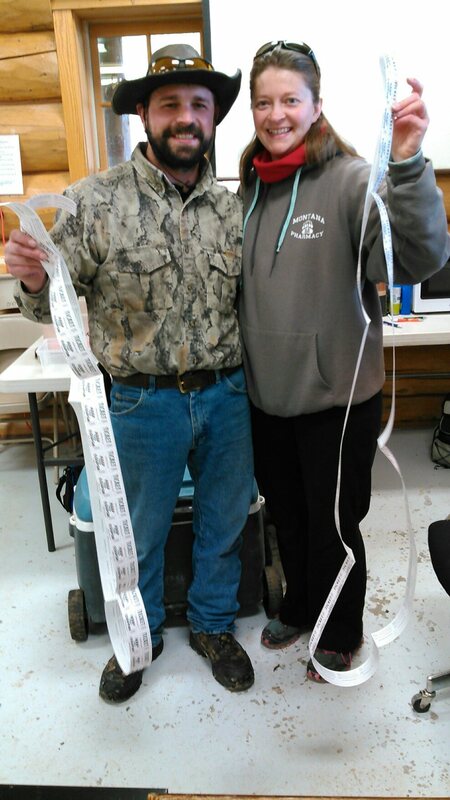 Total fish turned in on Friday was 1,998. Saturday the total was 1,370 with Jason North of Stevensville turning in a 100 day limit and Jason Mahlen with his second limit of 100. Sunday’s fish total was 1,114 with Steve Benson the only angler with the limit of 100 and his second of the event. Total entries for the first weekend were 4,482. Jason North of Stevensville had a great day on Saturday with his 100 fish limit and also a $500 tagged fish, Steven Benson turned in a $200 tagged lake trout on Sunday. $100 tagged fish were turned in over the weekend by Steve Benson, Dan Smith of Kalispell, Sam Cusker, Jack Kirkland of Missoula, Wes Wilkinson of Columbia Falls, and Jerry Benson of Plains. Leading the anglers who are competing for a Top Ten Angler spot which is one of the categories you can compete in is Steve Benson-1st with 275-100 on Friday, 75 on Saturday, and 100 Sunday, tied for 2nd and 3rd are Larry Karper of Florence with 264-95, 97, & 72-and Mike Benson with 264-100, 85, & 79, 4th Jason Mahlen with 252-100, 100, and 52, Sam Cusker of Bigfork is 5th with 232-100, 60, and 72, 6th Scott Bombard of Missoula with 193, 7th Tyler Varga of Kalispell-183, 8th Brandy Hilde with 181, 9th Ken Varga-Kalispell with 169, and 10th Felix Gauci of Stevensville with 150. Tyler Varga leads the 13-17 Category with 183-his catches were 94, 61, and 28. Second is Rylan Koch of Butte with 20, Abby Hodgson of Kalispell is 3rd with 13, Leah Banyai of Kalispell is in 4th with 10, and Jack Colyer of Missoula is 5th with 8. The 12 & Under Category has Matt Guckenberg Jr. of Kalispell leading with 47, Emmett Ludahl of Kalispell has 3, Tripp Bick of Arlee-1, and Brodie Smith of Kalispell has one. Second place behind Brandy Hilde with her 100, 14, and 67 fish days-in the Ladies Category is Julie Vacca of Florence with 28, Abby Hodgson of Kalispell is third with 13, Connie Jones of Kalispell 4th with 11, and Leah Banyai of Kalispell is 5th with 10. Smallest lake trout turned in were by Jerry Benson with a 184mm lake trout and Roger Olsen Jr. of Butte with a 182mm lake trout. Anglers compete in this popular category though out the event. There has been no large lake trout entry. Largest lake trout has to be over 36” and 24 lbs. or more to qualify. Tuesday through Thursday fishing begins this week with all entries turned in at Blue Bay before six o’clock in the evening. Anglers do not compete for the lottery drawing or merchandise Tues-Thurs but add to their bonus totals and compete for tagged fish, the Yeti Cooler, and six-$50 drawings. Fish pickups are only done at Big Arm and Polson if anglers telephone to let staff know they are out. Big Arm would be 5-5:30 and Polson behind the KwaTaqnuk Resort from 6-6:30. Somers pickup times are 3-4:30 and Wayfarers 5-5:30. Entries continue to be taken until the last day of the event. Telephone 406-270-3386 for information.